For all the Deadheads out there, check out our new Dancing Bears Needlepoint Belt. This belt was inspired by the Dancing Bears and is able to be customized. 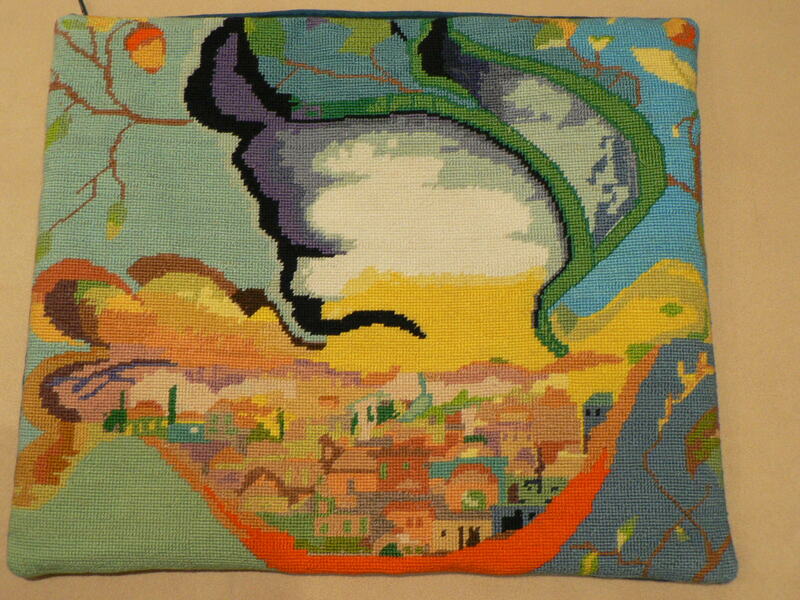 The background color can be changed and we can add a name into the needlepoint canvas. This makes a great gift for any Deadhead you know! This needlepoint belt is now available on our website. One of our customers recently shared with us some fantastic pictures a needlepoint belt we designed with her and that she stitched for her son. Really this post is all about the pictures she took and the great colors. She went to the store to hand pick the colors and really took the design to a new level. 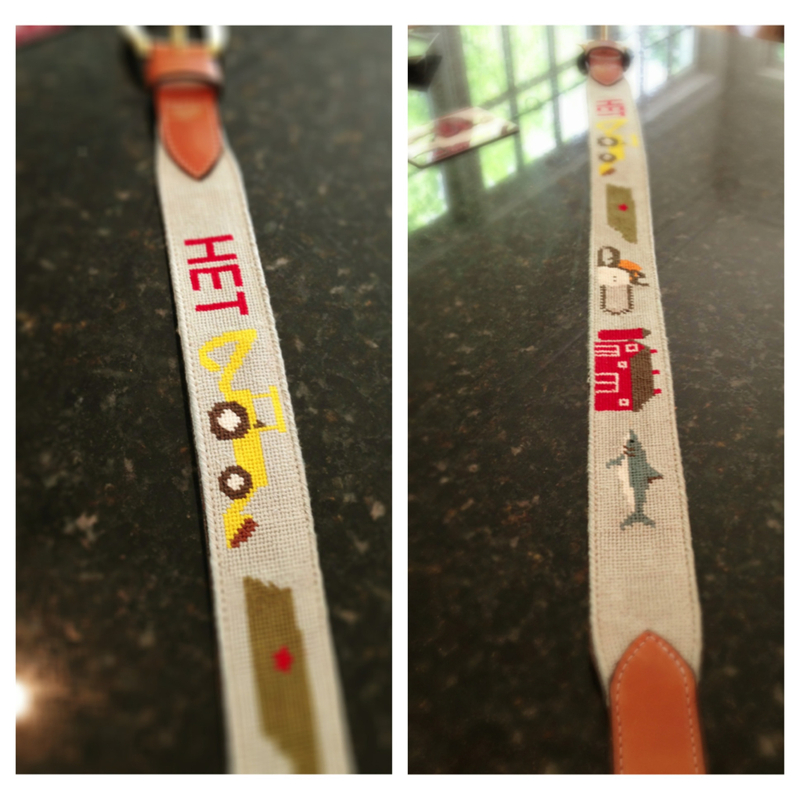 (you can see the original colors on our Needlepoint Belt Design’s Post) Great work Sloan! This Inland Lake Yachting Association Belt features the flags of the I.L.Y.A, Cedar Lake Yacht Club, Pine Lake Yacht Club, Lake Beulah Yacht Club, Clear Lake Yacht Club, Lake Geneva Yacht Club, Minnetonka Yacht Club, Pewaukee Yacht Club, and Green Lake Yacht Club. You can take away a flag and add your initials to make this a customized product! Great for a summer needlepoint project and available on our website now. Our new White Elephant Needlepoint Belt is a great design appropriate for all ages! Made on our custom canvases, this belt is the perfect gift or needlepoint project for the upcoming summer. The soft blue color allows you to wear it during all seasons, and is even great for kids. We are able to customize this needlepoint belt. You can request to change the background color, change the color of the elephants, or add your initials; whatever suits the stitcher’s needs! Available on our website now! I was at a wedding last week in Nantucket, and after going shopping and looking for ideas for needlepoint belts, I came across a lot of gingham patterns in the shops. This idea had been lingering in the back of my mind, so when a customer wanted a poodle needlepoint belt, I decided to put in the time and make it happen. While this is not the design that was right for the person she is making it for, she loved it and may order it for her husband! 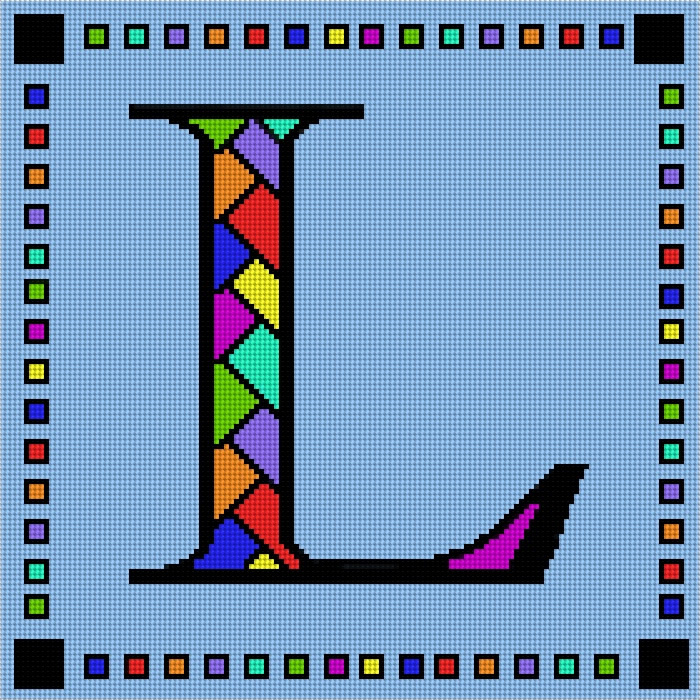 This needlepoint design will be customized to order. We can change the color, dog breed, and monogram. To see pricing click the following link for the custom preppy dog gingham needlepoint belt canvas. And contact us directly for finished custom belt pricing. Green Gingham Dog Needlepoint Belt Preview featuring a silver Poodle! The summer season is coming up and people are all traveling to the beach! Beach lovers will love this newly designed needlepoint pillow available on our website now. 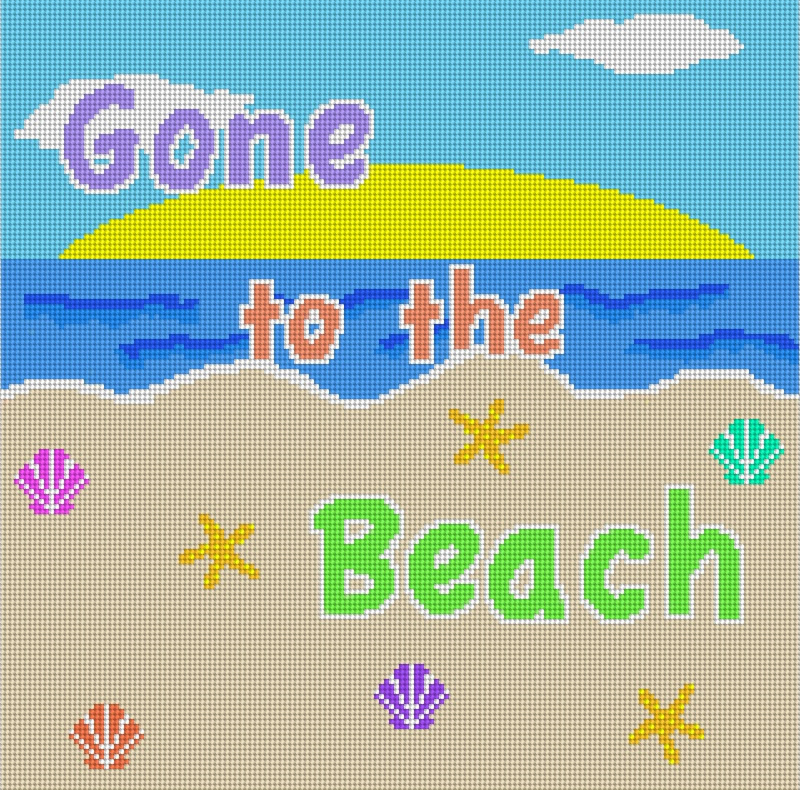 This “Gone to the Beach” Needlepoint pillow, with vibrant colors, fun text, and a summer sunrise, this needlepoint pillow is a perfect for the beach-lover or a great gift for someone who wants to spruce up their beach house. The color of the text on the pillow is customizable to fit the stitcher’s needs, as well as the starfish and shells at the bottom! This fun design is a great project for people of all ages! It always brings a smile to may face when our customers send back pictures of the custom needlepoint belts that we helped design for them. These belts all were made from needlepoint kits, that we sent out 1-3 months ago! 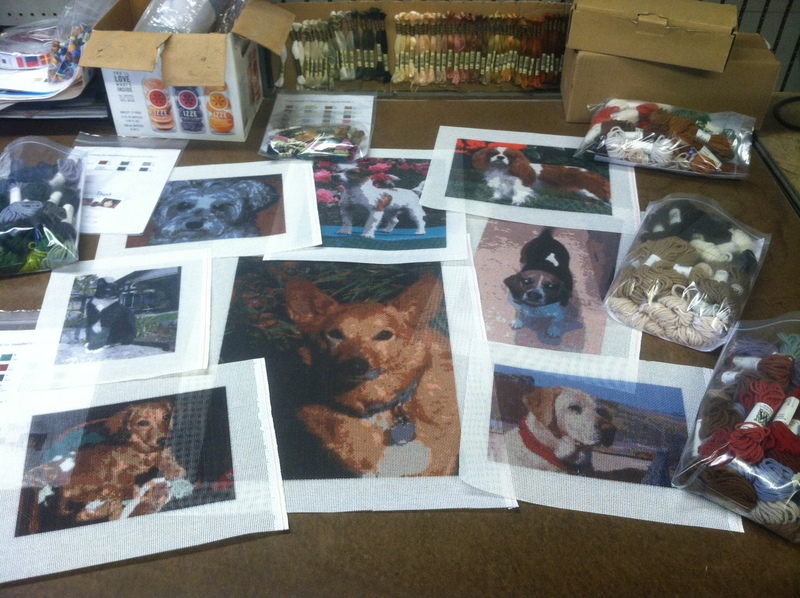 And, these projects are so fun, that both of the customers are working on new designs for other family members! Along with this subject, we’re always looking for a good belt finishers, so if you know one, please leave their information in the Comments on this post. If you have any ideas for a belt, let us know! Everybody loves personalized items, right? Something to show off your identity and personality, with a little pizzaz. If this is applies to you, then this pillow will be perfect! It is a modern, cubist, braid-style personalized letter pillow. We can customize the colors and the letter on the pillow to fit the stitcher’s needs. This pillow would make a great gift for people of all ages and will brighten any room! This new design is now available on our website.